The annual "winterim" trip to San Diego taken by the seventh and eighth graders at Alexander Dawson School in Lafayette, Colo., will be missing one element this year. The students will no longer be visiting SeaWorld, thanks to the efforts of one intrepid eighth grader named Phoebe Goldstein. Goldstein, a longtime opponent of whale and dolphin captivity, had heard of other schools nearby that took field trips to the marine park. When she heard that her own school was planning a trip, she was shocked - and driven to action. "As soon as I heard about this, I immediately contacted my mom and told her how upset I was," Goldstein told The Dodo. "I just knew I could not let my school go to SeaWorld." Goldstein immediately contacted the head of her school and the trip's organizer. "We discussed how our school wouldn't benefit by going to SeaWorld and supporting this atrocious issue," she said. "We also discussed how there might be other amazing activities to do on this trip instead of going to SeaWorld." Soon enough, it was a victory for Goldstein. After a few meetings with administrators during which she illuminated the issues associated with cetacean (whale and dolphin) captivity, the trip's organizers agreed to forego SeaWorld and replace it with a different activity. "I was so happy and I felt like I had actually made an impact on Dawson School," said Goldstein. "As part of Dawson's vision to help our students meet real-world challenges, we strive to support students who want to advocate for personal passions, whether that is protecting marine mammals or delivering malaria nets. Phoebe is another great example of that Dawson tradition, and we are proud of her efforts." Goldstein isn't the only student to pressure their school to skip the field trips to SeaWorld. One San Diego student launched a petition against holding prom at SeaWorld that gained over 2,000 signatures. And one school in Malibu, Calif. cancelled their overnight trip to the park last December after a 10-year-old student begged fellow students and administration to do so. 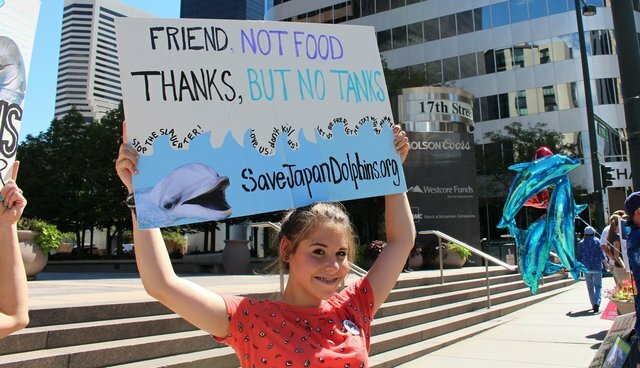 The girl had seen "Blackfish" and didn't want her school to support orca whale captivity. She was quoted as saying at the time, ""I never want to go to SeaWorld again."